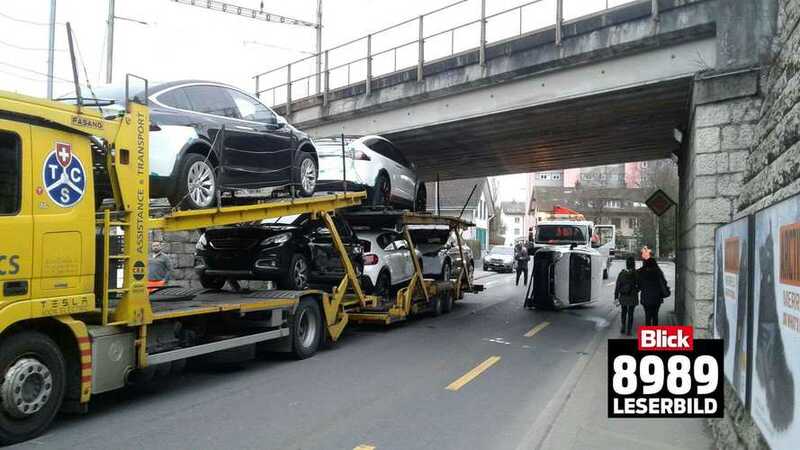 A truck transporting a few Teslas recently struck the underside of a bridge in Switzerland. It appears as though only a Peugeot van was damaged though. It seems the two Model X SUVs loaded on top of the truck carrier missed the bridge by inches due to their lower overall height. "The photo was captured by Swiss media outlet Blick showing the aftermath of the accident at the Brüggstrasse pass in Biel. According to local police reports, no one was hurt in the incident." It's believed that the transport truck had left the nearby Bern service center to delivery the three new Model X onboard to owners. The isn't the first time a Tesla transport truck has been involved in an accident and it certainly won't be the last. This time though, all the onboard Xs escaped unscathed.